Ok, so now you know your ready, but what’s next? How do you start? Here are some great ideas we think are some really cool Proposal ideas… please feel free to comment below if you want to add your own ideas. We love to hear from YOU! We met at a concert in San Francisco. A well-known DJ (Kaskade) was performing at the Bill Graham Civic Auditorium; I went to the show with my friends and she went with hers. Right before the start of the show, we happened to stumble upon the same step and our eyes met. Coincidentally, the show opened with a song called “Eyes,” which is about how eyes reveal true feelings and how love is easy to recognize just by looking into one’s eyes. We had an instant connection, singing to the lyrics of our favorite songs and dancing throughout what we both consider the most magical night of our lives. 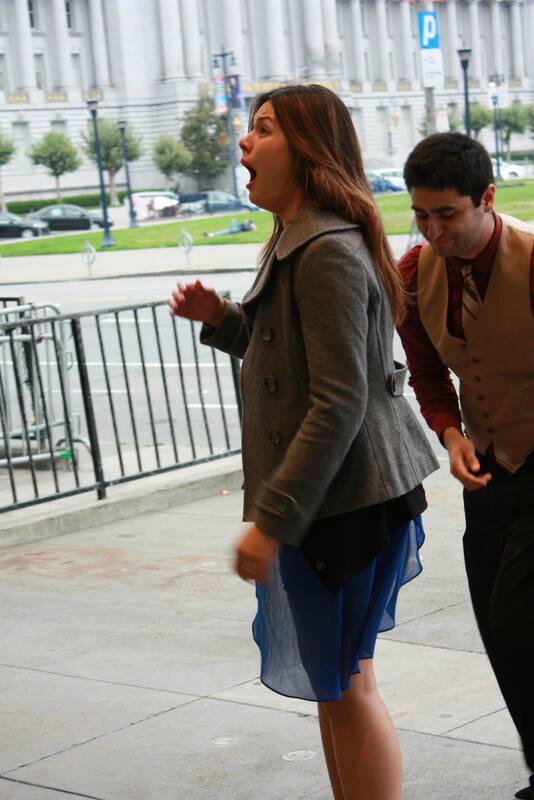 At the Bill Graham, exactly one year since we met! Knowing this would not be an easy task, I emailed the venue’s production company and asked them if it would be possible to coordinate a marriage proposal inside on the steps we met on. 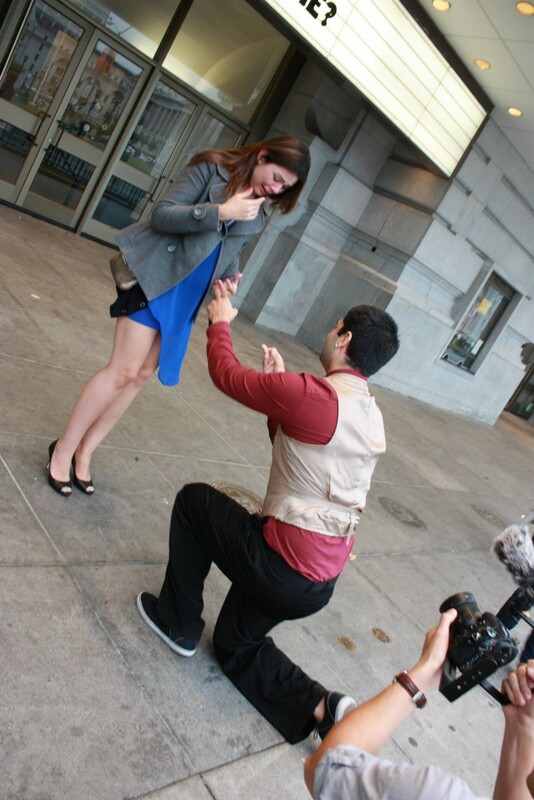 They happily agreed and helped me plan the whole surprise, which evolved into something even better! What does she love most about her engagement ring? Surprise! 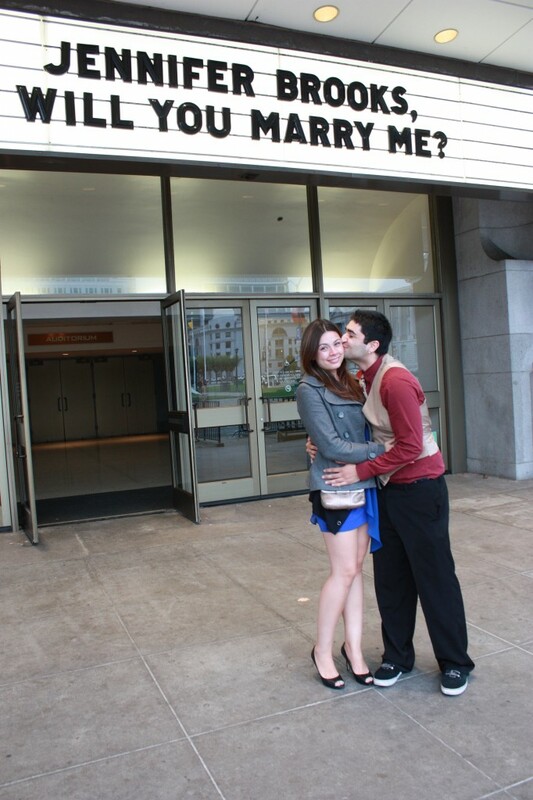 Jennifer is stunned to see the proposal message on the marquee. Jennifer’s eyes filled with tears, she said YES! Sergeant Jasmine was so in love with her boyfriend, Sergeant Luis. They met and bonded while they were in the same Army Reserve Unit. Confidence just overflows from Jasmine. She knew what she wanted and decided to go the non-traditional route. 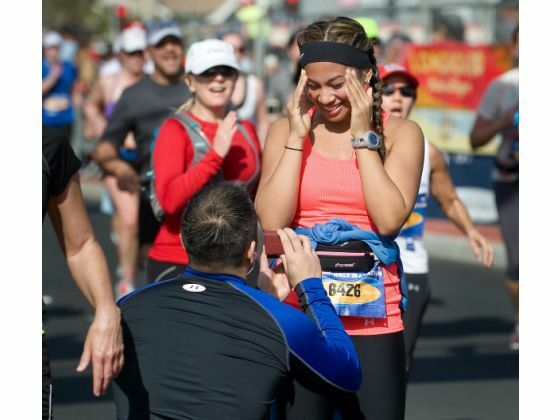 After she surprises and proposes to Luis, he in turn proposes to her! This unique love story (and this adorable military couple) makes hearts melt! Please feel free to comment below if you want to add your own ideas. We love to hear from YOU!